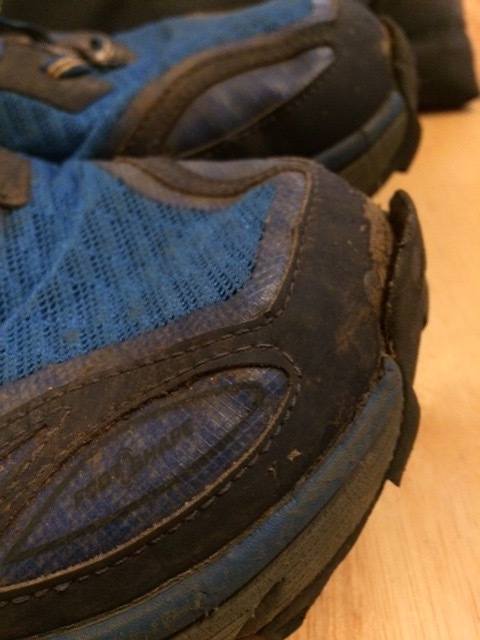 This is a blog post that pains me to write but because I’ve written glowingly about the Altra Lone Peak 3.0 but feel it is important to provide an update to a problem encountered with my favourite running shoes. Let me give some context to this post, I’ve purchased three pairs of Altra Lone Peak 3.0 (from Running Warehouse, London City Runner and Northern Runner). The pair I coveted most were the burnt orange option (Running Warehouse) as I find Altra send the muted colours to the UK which doesn’t fit my running tastes profile. I fell in love the moment I put them on and more than a couple of hundred kilometres in and I remained in love. It was at this point that I wrote my comparison review of the three main Altra trail running shoes. I couldn’t praise the changes enough, better fit, more robust, interesting design and a polish that had been missing in the 2.5 – these were brilliant. The other two pairs (bought from independent UK retailers) were saved for racing as I train in Inov8 and On Running shoes mostly. Therefore I went to Haria Extreme with shoes that had just 3 miles on them. Thankfully unleashed on the Martian like terrain the LP3.0 returned nothing but notes of joy as they sang across the race. The morning after the race the day before: The day after the race though as I was performing my post race kit clean up I noticed that the toe bumper had come loose – this was unexpected. A total of 85km had been done in the shoes and that didn’t seem much. However, if I’m honest I was more interested in having a nice post race holiday and so packed them away (individually wrapped as ever) and thought no more about them. For my final races of 2016 – Mouth to Mouth and the Mince Pi – I use older shoes like my Inov8 Race Ultra 290 and Lone Peak 2.0 which have lots of life in them but aren’t in my normal day to day shoe rotation so the LP3.0 stayed packed away well into the new year. Therefore when 2017 did come calling I still hadn’t given my LP3.0 much consideration and it wasn’t until MIUT rolled round in April that I got them out again to run in. However, looking at the damage to the toe bumper made me concerned about how they would protect me on the steep descents, more importantly might this damage provide a hazard during the more technical sections? Being positively minded though I assumed that I had simply had one bad pair and decided to unbox my third pair and rocked up to MIUT in them. This time I was quite aware of the possibility of problems with the shoe and therefore was keen to keep an eye on them. With MIUT though the course was so ball breaking that I soon forgot to check my shoes. It wasn’t until 50km in with daylight creeping over the horizon that I thought about my footwear and as I was shedding my night time kit and reworking my pack that I noticed that the toe bumper had started to work loose on a fresh out of the box pair! 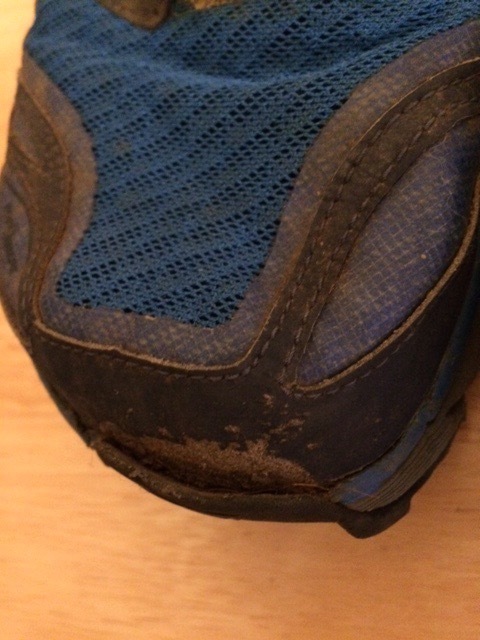 It was a massive disappointment because the shoe was so incredibly brilliant as it worked up and down the trails – such a tiny thing was going to ruin my experience. Three pairs of LP3.0 and two of them failed within 50 miles and while some might argue that you can still use them I don’t feel you can use them for some of the nastier technical trails I was running earlier this year. What next? I contacted Altra and their care team to tell them of the failures I had experienced, noting the distance I’d run in them, the terrain and as much other information that might help them provide a response. The care team wrote back swiftly advising that they take this kind of thing seriously and hope that feedback can inform improvements later down the line and that I should in the first instance contact the people I bought the shoes from, which seemed perfectly sensible. I very much appreciated the response from Altra USA and the reply struck the right tone for a brand on the way up. Sadly none of these seemed to be the case as I was fitted by Altra people for my Lone Peaks, they’ve never been in a washing machine and neither Madeira or Lanzarote were in extreme temperatures (24-26 degrees). Northern Runner simply replaced them after seeing the damage on a series of photographs I supplied but because I’d lost my receipt and it had been many months since I’d purchased them it was more difficult for London City Runner – although the Altra supplier did say they would see what they could do*. I’d like to stress the point that you really can’t fault the customer service, support or help in trying to find a resolution. Altra, Northern City Runner and London City Runner should be commended for dealing with me quickly. Though, it should be noted that it wasn’t replacement footwear that was at the forefront of my thinking, I just wanted to understand if there was a known issue. Understandably nobody seemed keen to answer this but if the shoe is prone to this particular failure then I simply won’t buy them anymore as at £115 for 50km running that’s a very expensive shoe. Now it is possible I’m the only person to have suffered the toe bumper coming away but I’m not sure my running style is so distinct as to make me the only person this has happened to. So the question now being posed is ‘Has anyone else had this problem?’ I’m interested to hear if others have faced this issue or other problems that I’ve been lucky enough to avoid. The next version? I live in hope that the Lone Peak 3.5 resolves this very minor but hugely inconvenient problem as I’m an Altra fan and a big advocate for giving them a go. I don’t want to start looking around for new brands – it took me long enough to find this one. And in truth despite the durability problems the Altra Lone Peak 3.0 is a buggeringly good running shoe. So Altra, get it fixed, I’ve got trails to conquer! *Despite good initial conversations I never got round to visiting London City Runner and returning the original shoes to solve this issue as I got caught out with bouts of illness, injury and racing! Very much my own fault and I would very highly recommend all the retailers mentioned in this post. …and when I head up to Meriden in a couple of days time I will be crapping myself about what I’ve let myself in for at Escape from Meriden. 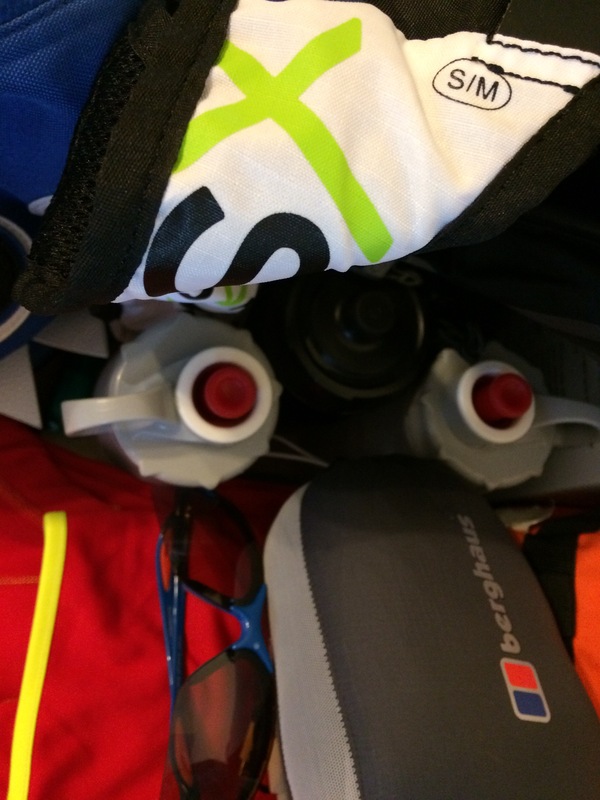 Previously on UltraBoyRuns: The year was going so brilliantly, I was training well, running well and dropping weight – I was on it like the proverbial ‘car bonnet’. However, failure at Barcelona albeit for technical reasons and clearly not being good enough to finish Madeira affected confidence and although there was the palette cleanser in the Marlborough Downs I’ve been pretty injured since then and hardly run at all. Injuries while attempting escape: Neither my heel or my groin injuries have settled but I’ve discovered that the heel pain can be offset by wearing supportive shoes (Altra Olympus please step forward) and my groin seems to be at its worst when I lie down (so I’ll try not to lie down). Perhaps my major injury concern is my back/kidneys which I haven’t been to get checked out – primarily because I asked to come off my doctors register due to their greedy narrow minded approach to healthy people and I’ve yet to source a suitable alternative – my bad. On the run again: My first foray back into running has been the Westminster Mile and while it’s one of my absolute favourite races and favourite distances it does nothing to prepare me for Meriden. There’s no time to catch up on training now and in truth I’m not ready to return to training, I’m only doing this event because I won’t need to compete in the traditional sense. I know I can probably hike the route I’ve got planned inside the time limit and that would be a good test ahead of SW100. The original escape plan: Meriden is something new for me with its lack of support and ‘go anywhere’ guide to routing and originally I had planned to be powered through it by a succession of 24hr Tesco and McDonalds. As for the route I was going to lumber out of Meriden and head straight for Charing Cross train station in Central London (which just happens to be outside the 90 mile black medal radius) and pretty much a straight line if you don’t take into account my little diversion across Hampstead Heath and Primrose Hill. Bish, bash, boom, job done. Then I entered for the South Wales 100 which takes place a mere 3 weeks after Meriden and I needed a Plan B. The revision: Knowing that the GingaNinja would be visiting her mum that weekend I considered a slightly less torturous distance – 123km (74 miles). I once again planned a pretty straight route down into sunny Wiltshire and found a good stopping point not too far from her parents and also well outside the gold medal 60 mile radius. The only problem is that this route is not so replete with 24hr supermarkets and fast food joints on every corner. It’s fair to say the route is crammed with beautiful scenery and patisseries but the kind that are only open for about 3hrs a day. I jest a little, there are ample smaller supermarkets but I was hoping to find something open in the middle of the night section for water resupply and this is worrying me a bit. However, a trick I picked up on an ultra some years ago suggested that often graveyards will have a drinking water tap… what is an issue is that I’m not sure if there’s something wrong with ambling around a graveyard in the dark looking for water or not – to say my moral compass is conflicted on this should come as no surprise. Survival or creepiness, hmmmm? Still with no training since Madeira nearly 6 weeks ago I’m figuring I’ve got bigger problems than whether I’ve got enough water. I’m going to Escape Meriden: This is hardly the Shawshank Redemption but the positives are that I’ve got a planned route, my kit is tested and ready to go, my train is booked and I’m actually looking forward to this new type of truly unsupported running. Am I genuinely worried? Yes a little bit – most other races I’ve run have people, aid stations and a safety net this strips all that away and gives you just one thing – yourself. But in reality I’m not trapped on Everest or in the middle of the jungle – I’m in the middle of England where the most dangerous thing I’ll come across are Tory voters. As I tow the start line of Meriden my thoughts will be on people like Ian Brazier and Gareth Jones who last weekend completed their own awesome race efforts at GUCR and Skye Trail Ultras respectively. I’ll be contemplating how hard UltraBaby worked for her Mile medal and I’ll be drawing on 4 years of ultra running experience to get my safely to my finish line. What happens if the clutch stops working and one of the wheels fall off your car and you’ve still got two thirds of your journey to go? 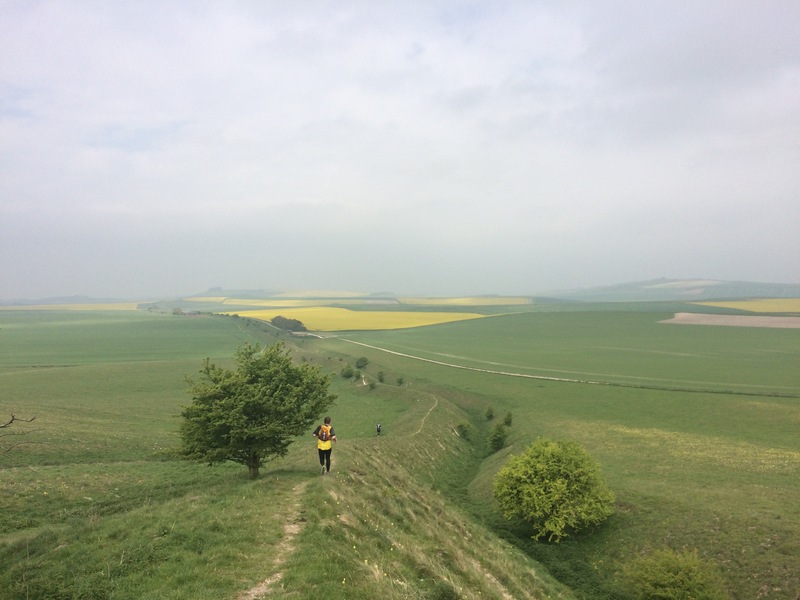 The answer is you get my experience of the Marlborough Downs Challenge. I felt surprisingly fresh at the start line despite having had a long day at work on the Friday, a long bus journey to Swindon and a sleeping situation that involved a very cheap child’s mattress in cramped conditions in a house that was much to warm with my daughter inches away from me. In my head this one read as a 33 mile amble but my legs said ‘hehe, let’s rock this one out’. And so as the runners kicked off my legs dictated a pace my head was telling me I’d regret later on. The key thing though was to ensure you were through the 9 mile checkpoint before the 2hr cut-off to ensure you were not thrust on to the shorter route. But I’m getting rather ahead of myself, something my head would remind my legs as they were forced around the supermarket later that day. There were probably about a hundred runners on the start line, most looked like seasoned ultra runners but it turned out, having spoken to many of them that the field was a wide and varied mix of ages, experiences and abilities. It had a really nice homely feel and was a comfortable race to be around, UltraBaby was made to feel very welcome and it reinforced my belief that I’m better off avoiding the bulk of the mass participation events as this kind of thing is exactly where I want to be. Anyway I set off at, what was for me, an almighty pace. I wasn’t doing my normal jogging along I was actually running and though there was never likely to be any issue with me troubling the front runners I was pushing hard. The route was ambling, rambling and delicious but all the while heading uphill and while the elevation profile wasn’t too severe there was enough to make you realise that this 33 miles was going to be a bit of a test – especially if you were still feeling a bit leggy from your Madeira adventuring. I’ve spent a lot of time in sunny Wiltshire and Oxfordshire but never really appreciated just how amazingly beautiful it actually is. 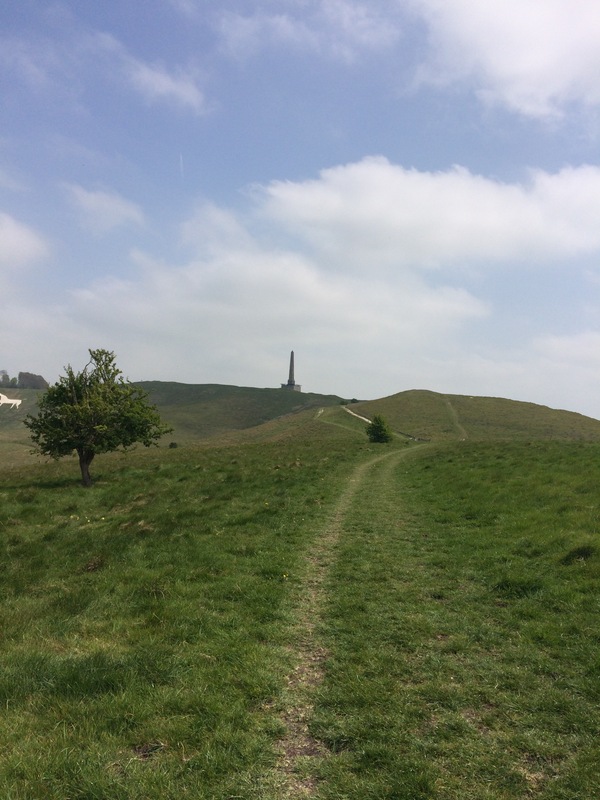 The Marlborough Downs Challenge resolved this omission in my visual enjoyment and as I pressed on there was still enough time for a few photographs and intakes of breath as I admired my surroundings. Checkpoints started to fall quickly and I was actually having a tremendous out of fun, there was only one small problem and that was my legs were tired, sore even but the joy of the route was keeping me going. The problems became more troubling when I pulled something in my knee and my groin and while I knew these issues would leave me ruined at some point I decided to push ever onwards. With checkpoint 3 passed I stopped for a slightly longer jelly baby and photo opportunity, one of which is the image that opens this blog post and from here I came across what was to be my favourite part of the route and a fast downhill section with a series of fast up and down bumps that I could launch myself along – glorious. The race was now starting to open up and despite making good time the injuries and lack of match fitness were catching up with me and some of the runners I had passed earlier were starting to catch me up and a good finishing time slowly started to ebb away. However, a good finish time had never really been the intention but would however have been a real bonus. More checkpoints fell and I met several very lovely runners, several new to the ultra running scene and several veterans, all extremely interesting and each with stories that would help pass the miles by. 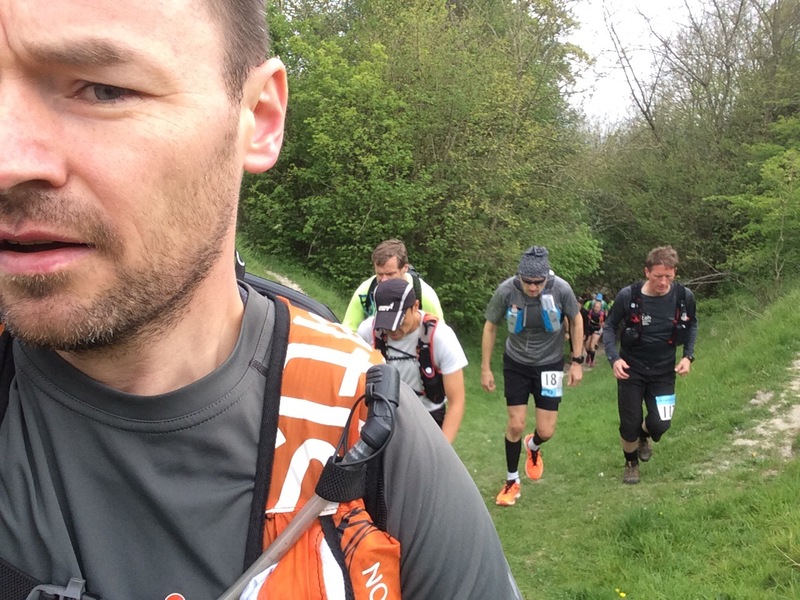 Alison, Marc, Liza and many others contributed to a grand day out and I recounted my many tales of stupidity as an obsessed ultra runner and a ridiculous parent. Into the latter sections I started to chow down on larger and larger handfuls of dolly mixture and jelly babies and insisted on a ‘free hug’ from one of the lovely volunteers at the race – who duly obliged to both myself and one of the other runners. It was this combination of experiences that reminded me very much why I love eventing, it’s the comaraderie that sweeps through races like the Marlborough Downs Challenge that keeps me going back and risking life and limb. 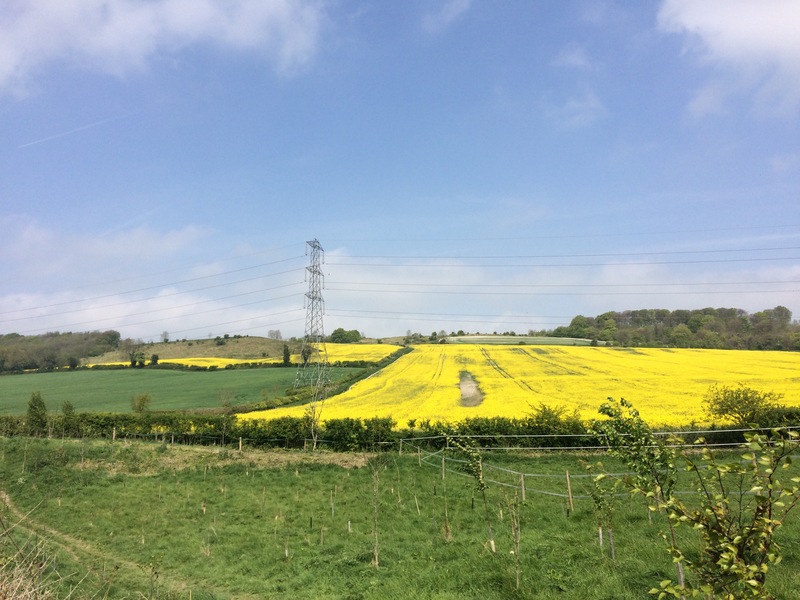 The fact that I’d sweep my way past one of the beautiful Wiltshire white horses and drift through the delightful Avesbury stone circle simply confirmed this as a very scenic event. By Avesbury though and with 11km still to go I was shot to pieces and I was grateful to reach the final checkpoint and pick up some runner support for the finish push. 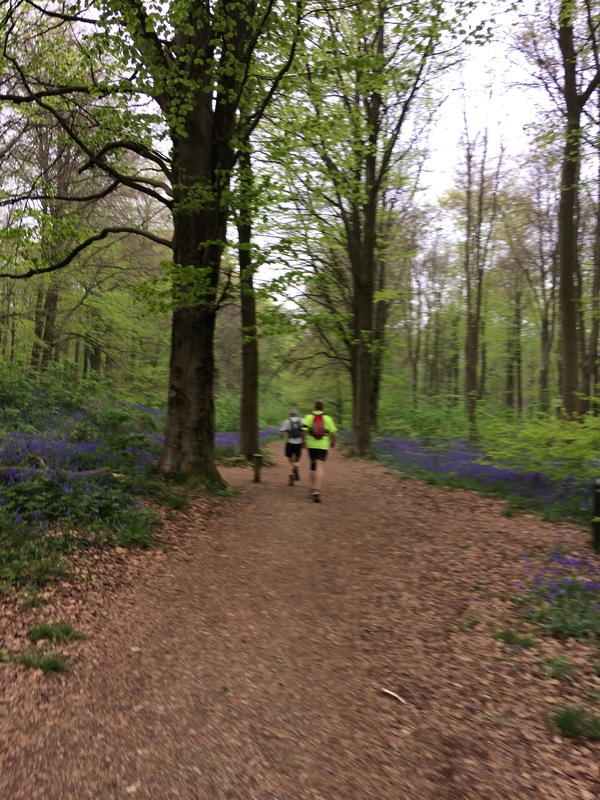 My companions and I trundled down the final descents and back into Marlborough discussing the delights of the Lake District and running with (grand)children – thank you very much guys, especially Liza who made those last 2 miles much easier. As I approached the finish in the distance, a few hundred metres to go I came across UltraBaby who waved wildly as she caught sight of me. I turned to Liza and said I’d catch up to her at the end and I drifted off to run the final section with my family. I crossed the line, delighted to be finished at this glorious event. Route. The route was interesting and filled with historical delights including Avesbury Stone Circle. 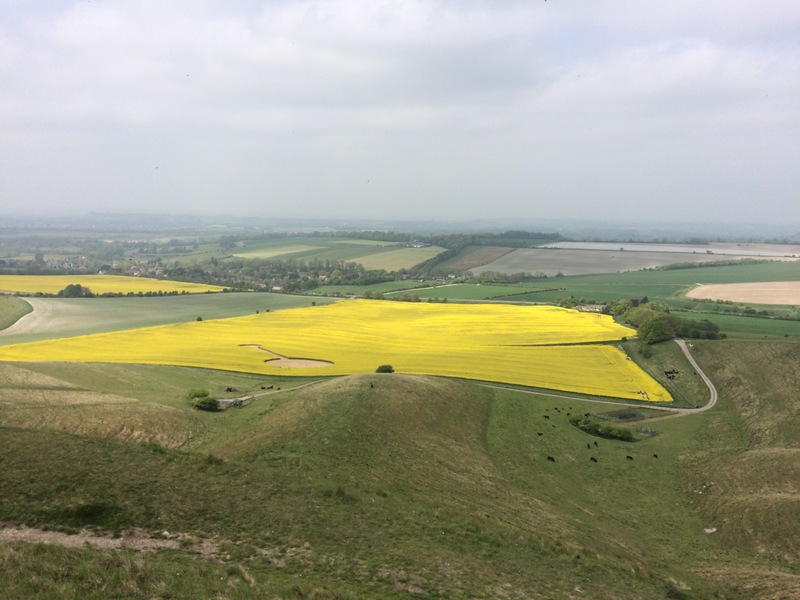 The hills and the trails were truly exceptional, I had expected them to be like the South Downs (which I find a little dull of I’m honest) but actually the Marlborough Downs are often spectacular and deserve much recognition for this. The route was very dry which I’m sure many will consider a bonus but I found it hard underfoot even with well supported shoes and those in road running trainers probably made the right decision. My only criticism would be the amount of gravel paths which is a personal thing as I find it difficult to run on, preferring muddier trails but this is very much the nature of the area rather than a criticism of the route. It’s a route you’ll enjoy when you decide to sign up and will live long in the memory. Awards. 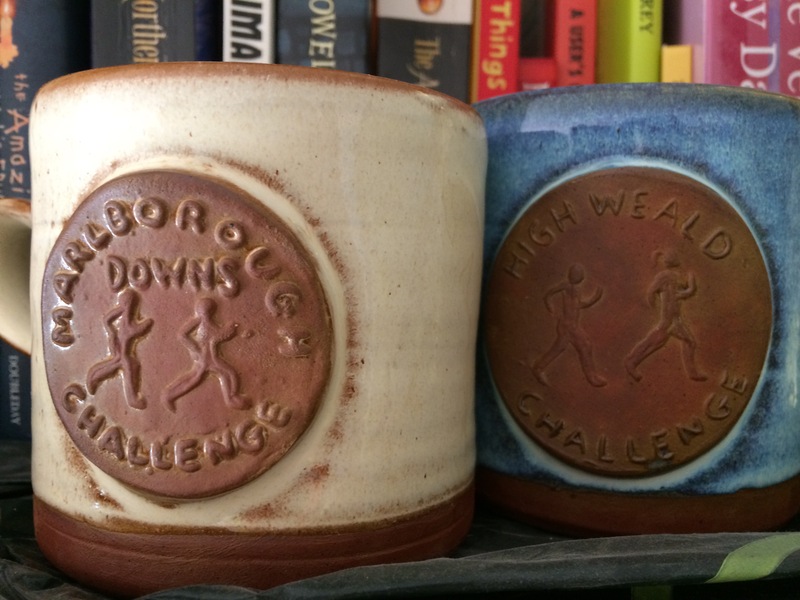 A hand made mug inscribed with the event name – delightful and I chose a short and stout one in white to contrast against a similar mug I received at the High Weald 50km last year. They are lovely mementos of a lovely race. Organisation. Absolutely faultless, from start to finish and with people positioned at key difficult crossings – perfect. Volunteers. I have only good things to say about the awesome army of wonderful volunteers who laughed and joked with runners as they ambled their way around. Thank you very much to all of them, especially the lady with the giant bag of jelly babies and the free hugs! Conclusion. Fun route, good awards, well organised and great value for money. You’d be mad not to give this a go – but don’t underestimate it, the route is runnable but challenging and is festooned with many a photo opportunity that will inevitably slow you down. 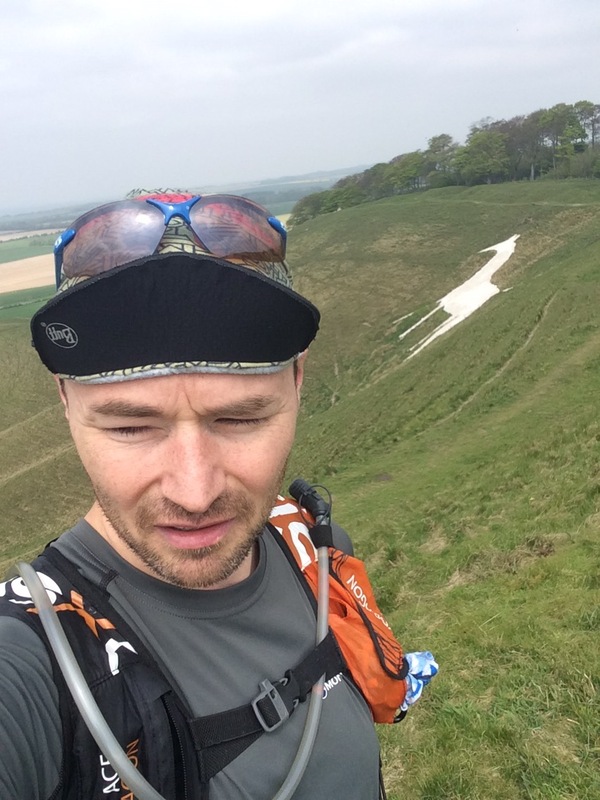 I thoroughly enjoyed the Marlborough Downs Challenge and if I were looking for a late spring race in beautiful surroundings this would make the shortlist every time.